Australia’s number one chocolate biscuit*, the Tim Tam, has gotten a whole lot tastier. Arnott’s new Tim Tam Slams are an innovative version of the iconic biscuits, specifically designed to create the ultimate flavour sensation. The new range of Tim Tam Slams comes in three delicious flavours including; Choc Malt & Sticky Caramel, Choc Hazelnut & Gooey Caramel and Dark Choc & Sticky Raspberry. Concealed in the depths of Arnott’s HQ, food chefs at Arnott’s have spent countless hours tirelessly testing flavour combinations, beverage compliments and oozy centres to come up with what promises to be the most enjoyable Tim Tam to Slam, yet. Never before has a Tim Tam been created to maximise not only its flavour, but the entire Bite, Sip, Slam experience too! The internal structure of the new biscuits has been designed with a gooey core to create a flavour explosion when a warm beverage is drawn through its centre, a process known as the ‘Tim Tam Slam’. The popular snacking ritual involves biting the diagonal corners off the Tim Tam, dipping the bottom corner in a warm beverage and sipping the hot liquid and the melted filling of the biscuit through the gap in the top corner before slamming the whole thing in the mouth for an explosion of chocolate, cream and biscuit. Late last year, research commissioned by Arnott’s showed that a whopping 90% of Australians claimed to eating Tim Tam biscuits, and an astounding 4.1 million eat them on a weekly basis. Now, thanks to the Tim Tam Slams, the love affair between Aussies and their beloved Tim Tam is set to intensify. The Tim Tam Slams range, while aesthetically resembling the original Tim Tam, are inspired by flavours that pair well with common warm beverages such as tea, coffee, warm milk and hot chocolate. You can also enjoy a slam with cold beverages too on those warm Aussie days. 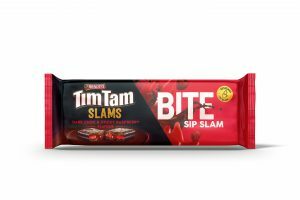 Matt Grant, Arnott’s Marketing Manager, Tim Tam said, “We are excited to deliver what Australians have been asking for… a Tim Tam designed specially to Slam! “We have been overwhelmed with consumers who enjoy doing, sharing and teaching the Tim Tam Slam and have been calling for a Tim Tam which enhances this ultimate indulgent biscuit ritual.